Breakfast is my favourite meal of the day, but lets face it during the week nobody has the time or the inclination to fanny about cooking up an elaborate breakie. So come the weekend its always nice to pull your finger out and make a bit more of effort. This was a bit of a spur of the moment thing, I only had a basic recipe which I changed and embellished and this was the fruits of my labour, or not as the case may be as its a super quick and really easy recipe with loads of ways you can customise it to your tastes. Plus its ridiculously yummy. Fact. So dig your frying pan out sharpish and get cooking...you can thank me later. *I used Sainsbury's Freefrom White Sliced Bread, the slices are smaller and hold the mixture better without falling apart as it can with larger sliced bread like Genius. Start off by slicing your strawberry tops off and halving them, throw them in a bowl with the raspberries (if you're using bananas you won't need to do this stage) and sprinkle over the sugar and give them a stir and put aside while you get on with Frenching your bread. Melt the butter in the microwave and stir in the cinnamon. In your shallow dish crack in your eggs and whisk them until well beaten. Pour in your cinnamon/butter mix and whisk the whole lot together thoroughly. Throw a large knob of butter into the frying and melt over a medium to low heat until the butter starts to froth. Keep the heat on the lower side, whacking it up high will burn the butter which smells and tastes beyond rank. Dip your bread in the egg mixture, laying them down into the dish soaking one side before turning it over and repeating the process on the other side. Lay the bread face down and fry for around 30 seconds, pressing the bread down with the underside of a spatula. Once golden brown, flip over and repeat the process on the other side and then with the other slices of bread. Dish the bread up onto a plate covered with a few sheets of kitchen towel to soak up any excess grease and then dish up onto a clean plate. 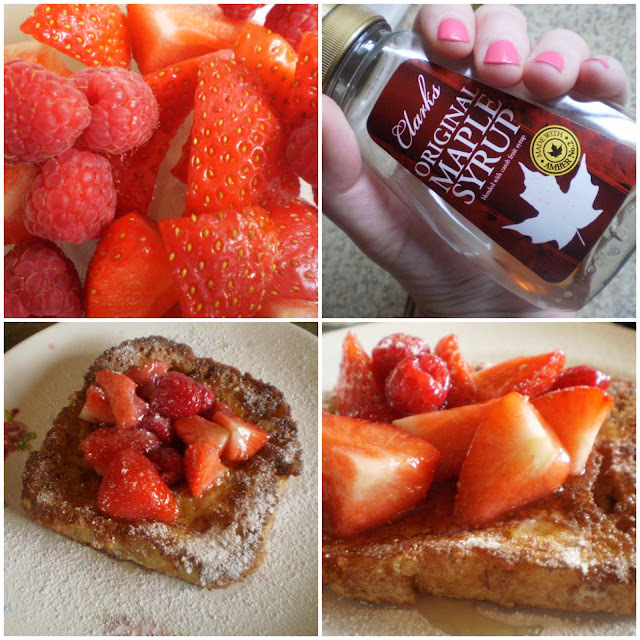 To serve, pile a good old heap of your fruit and a little bit of the fruit liquor over your French toast, dribble over some maple syrup and sieve over a light dusting of icing sugar. If you don't find this breakie yummy I shall eat my shoes. And my hat. Eat, enjoy and don't tell anyone..we don't want everyone knowing..
Labels: Blissful Breakfast Ideas, sainsburys. Looks and sounds amazing! Will have to give it a try. Aw, I miss your blog! This is one of my fave breakfasts, french toast is scrummy.